We are delighted to welcome you to Trianon Music Group and hope that you will enjoy playing with us. As well as the three major concerts each year that Trianon performs, there are a whole host of other music related activities in which you will, of course, be very welcome to participate. Details of these are included in Trianon News, which is posted out to members three times a year with the rehearsal schedule and commitment slip before each concert. Information is also given out at rehearsals and will be available on our Web Site: www.tmg.org.uk. We are on Facebook and please also follow us on Twitter@MusicTrianon. Tickets. We produce good quality Concert Publicity and promotion materials in the form of posters and handbills – you are encouraged to circulate these in your local area. You can strongly influence our audience numbers by personally inviting friends, colleagues and family members to support our concerts. Tickets are available in advance from John Barratt, the Card Centre, 6 Hamilton Road, Felixstowe, IP11 7AU. Tel: 01394 283170/ 07876 787029. felixcards@keme.co.uk. Attendance – please check your availability for rehearsals and indicate likely absences as soon as possible on the Register, which is available at every rehearsal. A sectional rehearsal is usually planned leading up to each major concert. Attendance at these, and also on the morning of the concert, is really important. 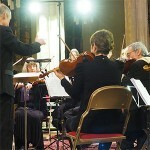 Music – music for the concerts is provided by Trianon. Please only use soft pencils (at least a 2B lead) to mark copies – never mark in ink!!! Take care of your music – we would need to ask you to replace any lost music.